Your predecessors have created an excellent reputation at MU we hope that you will continue. Knowing that you are anxious to become settled in Columbia and prepared for your first day of clinical rotations, we have provided this website as a means to provide you with information on a more timely basis than the mailings, which you will also be sent. Student schedules are designed on an individual basis to balance student assignments and maximize the learning experience. Please contact Dr. Linda Berent or Jennifer Hamilton if you have any other questions about your transition into your year at the MU College of Veterinary Medicine. Columbia, Missouri is an ideal location for a teaching hospital. The population of central Missouri and reasonable proximity to St. Louis and Kansas City provide for a robust small animal emergency and referral caseload. Moreover, Missouri is a strong agricultural state with large numbers of horses, cattle, hogs, and poultry. The University of Missouri campus is home to a life sciences center, medical school, nanotechnology center, and college of agriculture. These campus resources create a synergy that allows us to conduct high-quality research and practice cutting edge medicine. You can purchase a membership to this state-of-the-art recreation and fitness center. Click on ‘Facilities’ for a virtual tour. Click on the ‘Membership’ for more information on joining. Veterinary medical students are at higher risk for exposure to rabies and tetanus than the general population. Therefore, you will need to provide records of tetanus vaccination within the last 10 years and the final vaccination in an initial series or a booster vaccination for rabies within the last year. Alternatively, a protective rabies titer (1:5 or greater serum dilution RFFIT) should be demonstrated within the past two years. Vaccinations and serum titers are performed at the College of Veterinary Medicine in Spring each year. The University of Missouri, in accordance with Centers for Disease Control (CDC) guidelines, requires that all newly enrolled or readmitted MU students born after December 31, 1956 must comply with the two-dose Measles Immunization Policy. If a second immunization is needed, it must be the combined MMR vaccine. Students who do not comply will not be allowed to register or pre-register for their second semester at MU. 2 doses of MMR vaccine. The first dose must have been given at age 12 months or later. The second dose must have been given at least one month after the first one. Titer (blood test) results proving immunity to measles, mumps and rubella. Documentation is required. *A waiver for medical, religious, or philosophical reasons may be granted if valid proof is provided. Download the MMR and TB screening form. This form must be competed prior to entering the clinical curriculum at MU. Veterinary medicine is a relatively dangerous profession. There is always risk of injury when working with animals. In addition, you may be exposed to zoonotic diseases during the course of routine preclinical or clinical training. Please note that students are responsible for the cost of their own medical care during their veterinary training. Thus, all students are required to have health insurance. What do I wear and what supplies do I need? This varies and depends on each rotation you are assigned to. Coveralls and clinic jackets are standards for clinical rotations and may be purchased from the Missouri Veterinary Education Service. This not for profit, student-owned bookstore also stocks books, stethoscopes, and other supplies that you will need on your clinical rotations. You can learn more about the bookstore. What is my clinical rotation schedule going to be? What do I do during my elective rotation? Ross University and St. George’s students can elect to complete this rotation by taking elective courses at the University of Missouri. Two-week rotations may be taken at the Veterinary Health Center. Alternatively, students may choose to complete an evaluated preceptorship in a private practice. 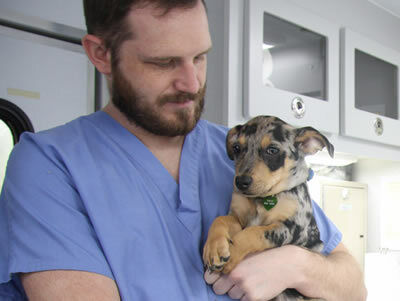 These off-site experiences require supervision and evaluation by a licensed veterinarian in good standing and the student should gain experience in diagnosis, treatment, surgery, and practice management. A total of 2 weeks and 60 hours is the minimum time required for an acceptable preceptorship and students are strongly encouraged to spend as much time as possible observing and assisting with case management. Other preceptorships may be chosen in the areas of public health, epidemiology, or research. Supervisors for those preceptorships can be either a DVM or PhD. Questions about the suitability and evaluation of a preceptorship experience should be directed to Barb Calvin in Student Affairs. The student must leave a forwarding address with the Office of Student Affairs prior to leaving for a preceptorship. On-site clinical electives can be found here. Island students may also choose to take the following core MU clinical rotations as electives: Theriogenology, Ophthalmology, Neurology/Neurosurgery, Oncology. If you choose to complete on-site electives, you should contact the Associate Dean for Academic Affairs to check for availability and for advanced scheduling. If you have a documented physical or learning disability, please review the Schedule of Courses. If you anticipate the need to ask for accommodations, please contact Dr. Tennison (573-882-1902) as soon as possible. You also need to discuss any possible accommodations that will be requested with affected course leaders at least 60 days before the course begins. You may contact Dr. Tennison to assist you in arranging the necessary meetings.